Kitchen Adventures… when life takes me outside the kitchen! 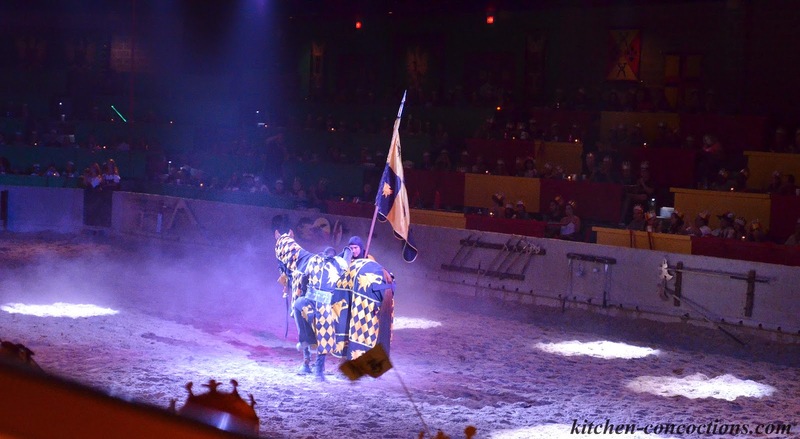 This time we kicked something off our bucket list when we broke bread with winches and got swooped away by knights in shiny armor at Medieval Times! Lately experiencing all that life has to offer… kicking things off my life’s bucket list… you know living life to it’s fullest… well has been super important to me. Maybe it is because I work all.the.time or as I, cough, cough get older and realize life is short; but instead of maybe one day or someday, I just do it. You know whatever it maybe. Stopping to enjoy the view. Not putting off getting together with friends. And just making things happen. 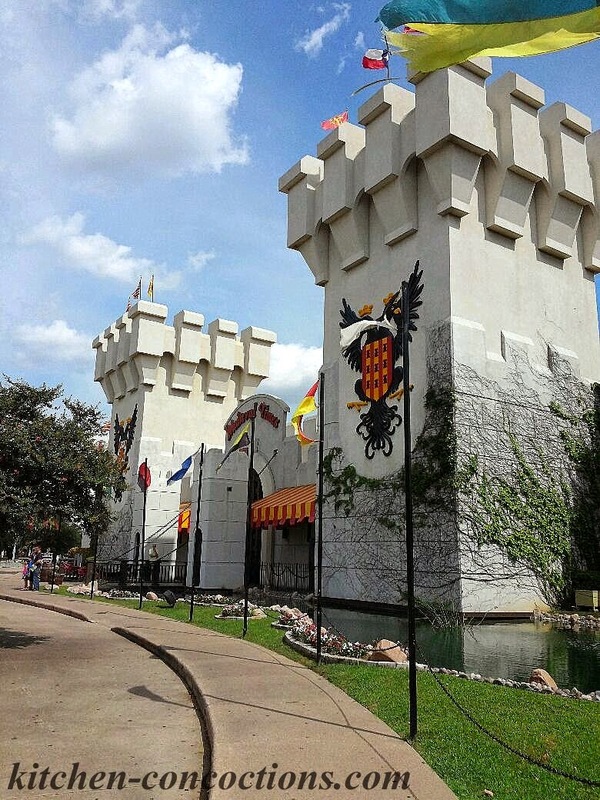 With that being my life’s motto, on a recent trip to Dallas, I decided for one of our activities I wanted to visit Medieval Times. It has been on both of our bucket lists for as long as I can remember, so we decided to just go! When you first arrive all parties are given a colored paper crown (that you MUST wear!). I wanted to arrive early to get a good seat but the color of your crown is your “assigned” seat. Note: You can for ticket upgrades to get extra perks like preferred seating, souvenir photo, etc. 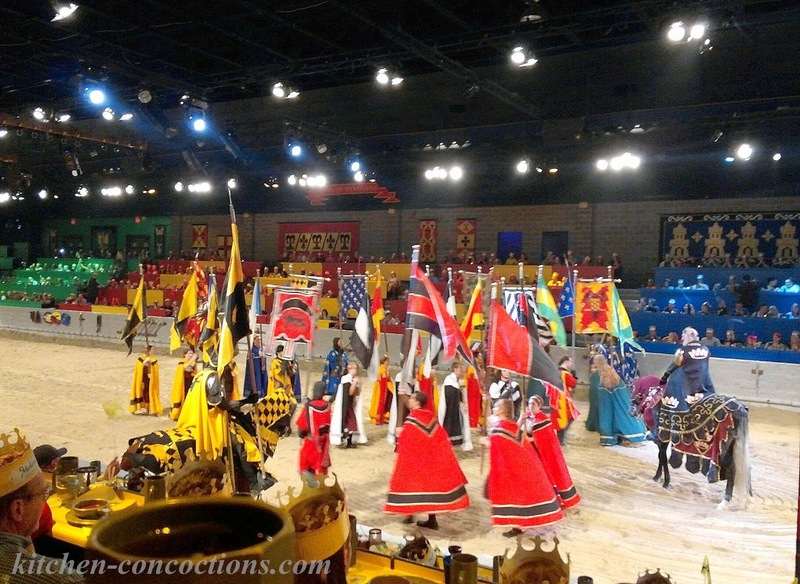 After you receive your crown and move past the multiple opportunities to take a staged photo (for an additional fee) you move into a large indoor “courtyard”. This is where you wait until they call your colored hat for the show. In this area you can purchase souvenirs or beverages. 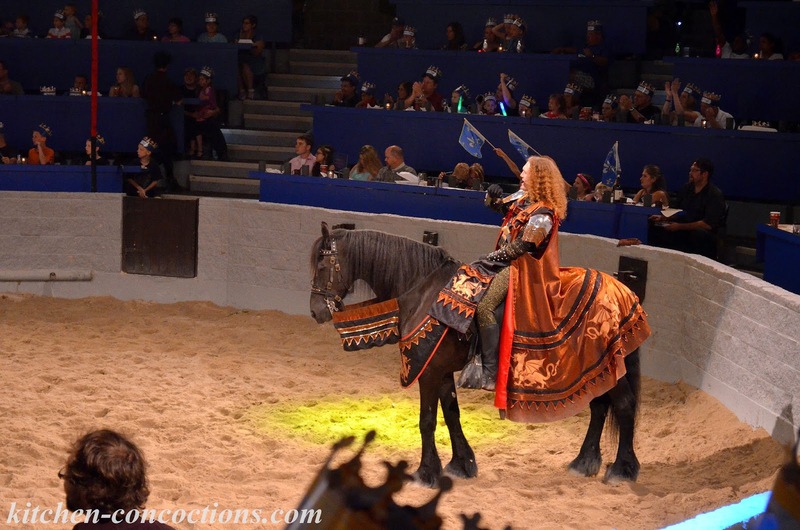 The Entertainment: The show was a full production with horses, owls, knights in shiny armor, and of course a king and princess! It is an interactive show with the cast coming into the audience, passing out roses to select guests, etc. 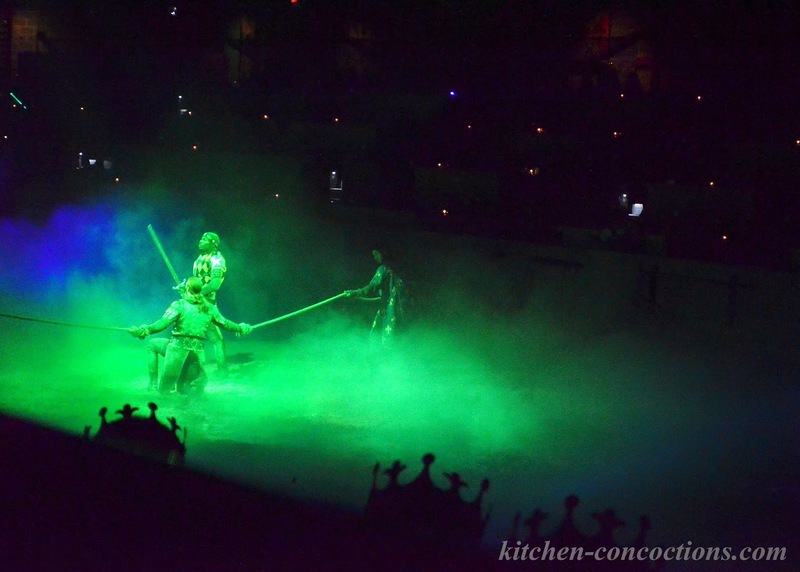 Each color coded section had a knight to represent them and fight to win the princess. Our knight actually won and I say it is because of all my vigorous clapping and cheering. The food: Dinner also represented the time period well. Everything was very simple and served rustic. And when I mean rustic, there is no silverware (wash your hands!) and your server just walks by and plops the food down on your plate while you watch the show! Note: Water, tea and Pepsi are included with your ticket, any other beverages (alcoholic and non) are an additional charge. Everyone is served the same menu unless you specify vegetarian when you make your reservation. Our menu consisted of garlic toast, tomato soup, a potato wedge, half of a whole rotisserie chicken, a pork rib and an apple turnover for dessert (nothing extraordinary, but the portions are large and filling…. which fits the time period perfectly!). 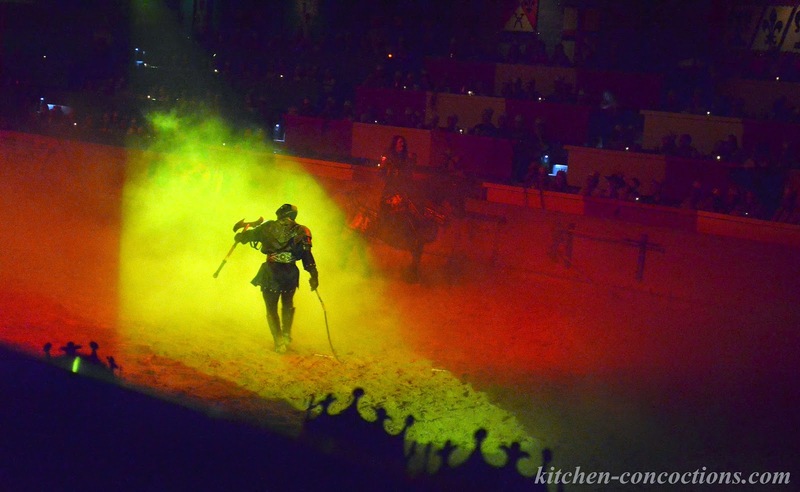 We had so much fun at Medieval Times and recommend it if you have never been (especially if you like cheesy themed dinners/date nights… like me… in fact the cheesier the better! Smile!)! If you live near one it is a great “out of the box” date night and if you are vacationing it is something the whole family (probably kids ages 4 and up) will love. Price: Adult- $60.95 (+tax and processing fee) Child- $36.95 (+tax and processing fee) Note: Check for special promotions and discounts before going!